The satellite — the Transiting Exoplanet Survey Satellite, or Tess — will scan almost the entire sky for at least two years. NASA’s Tess spacecraft embarked Wednesday on a quest to find new worlds around neighbouring stars that could support life. Tess rode a SpaceX Falcon rocket through the evening sky, aiming for an orbit stretching all the way to the moon. The satellite — the Transiting Exoplanet Survey Satellite, or Tess — will scan almost the entire sky for at least two years, staring at the closest, brightest stars in an effort to find and identify any planets around them. Hundreds of thousands of stars will be scrutinised, with the expectation that thousands of exoplanets — planets outside our own solar system — will be revealed right in our cosmic backyard. Rocky and icy planets, hot gas giants and, possibly, water worlds. Super-Earths between the sizes of Earth and Neptune. Maybe even an Earth twin. “The sky will become more beautiful, will become more awesome” knowing there are planets orbiting the stars we see twinkling at night, said NASA’s top science administrator, Thomas Zurbuchen. Discoveries by Tess and other missions, he noted, will bring us closer to answering questions that have lingered for thousands of years. Does life exist beyond Earth? If so, is it microbial or more advanced? But Tess won’t look for life. It’s not designed for that. Rather, it will scout for planets of all sorts, but especially those in the so-called Goldilocks or habitable zone of a star: an orbit where temperatures are neither too cold nor too hot, but just right for life-nourishing water. The most promising candidates will be studied by bigger, more powerful observatories of the future, including NASA’s James Webb Space Telescope, due to launch in another few years as the heir to Hubble. These telescopes will scour the planets’ atmospheres for any of the ingredients of life: water vapour, oxygen, methane, carbon dioxide. “Tess will tell us where to look at and when to look,” said the mission’s chief scientist, George Ricker of Massachusetts Institute of Technology. Tess is the successor to NASA’s Kepler Space Telescope, on its last legs after discovering a few thousand exoplanets over the past nine years. Astronomers anticipate more than doubling Kepler’s confirmed planetary count of more than 2,600, once Tess’ four wide-view cameras begin scientific observations in early summer. Unlike Tess, Kepler could only scour a sliver of the sky. The total exoplanet census currently stands at more than 3,700 confirmed, with another 4,500 on the not-yet-verified list. That’s a lot considering the first one popped up barely two decades ago. Until about 25 years ago, the only known planets were in our own solar system, noted NASA’s director of astrophysics, Paul Hertz. While Kepler has focused on stars thousands of light-years away, Tess will concentrate on our stellar neighbours, dozens or hundreds of light-years away. Most of Tess’ targets will be cool, common red dwarf stars, thought to be rich breeding grounds for planets. To find the planets, Tess will use the same transit method employed by Kepler, watching for regular, fleeting dips in stellar brightness that would indicate a planet passing in front of its star. That’s the best astronomers can do for now. By sticking to stars closer to home, it will be easier for Webb and other massive telescopes planned for space and Earth to sniff out possible signs of life in the atmosphere. It also will be more feasible for robotic explorers to set sail for these new worlds in the decades and centuries ahead. For such a large undertaking, Tess is surprisingly compact and its mission relatively inexpensive at $337 million. Smaller than a stacked washer-dryer, the 5-foot-tall, 4-foot-wide, 800-pound spacecraft (1.5-meters by 1.2-meters and 362 kilograms) is bound for an elongated orbit of Earth, with the far end skirting the orbit of the moon. Tess should come within a few thousand miles of the lunar surface on May 17. The moon’s gravity will help get the satellite in the right orbit and keep it there. The cameras — equipped with wide-angle lenses a mere 4 inches across (10 centimetres) — will be off during the lunar flyby. “No moon selfie,” said Robert Lockwood of Orbital ATK, which built Tess. Tess team members revelled in Wednesday’s smooth, photogenic flight through clear skies, and NASA officials were delighted to clear the way for a May 5 launch of the Mars lander, InSight, from California. 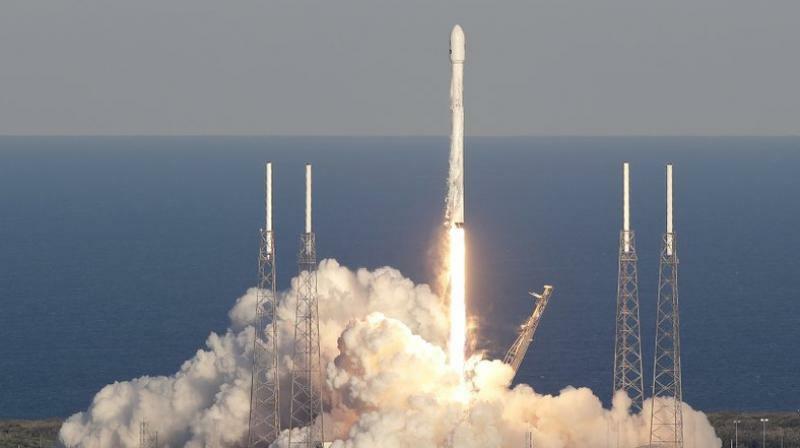 SpaceX employees had another reason to celebrate: The first-stage booster rocket landed on an ocean platform following lift-off, to be recycled for a future NASA mission.